Best Wedding Caterers in Dehradun: The city of Dehradun has been famous for a lot of reasons over the years. One thing that Dehradun is quite renowned for is the culture of Big Fat Weddings in the city. There are numerous options for anyone seeking to get a venue booked for a Wedding. From Hotels to Banquet Halls and Outdoor Farms, the choices are plentiful and one can decide upon the venue of their choice depending on the weather, location and their budget. Of Course when we think of organizing a Wedding, the most important factor besides the Venue is the food. The food to be served to the guests attending the wedding is the most vital factor to please everyone at the Wedding function. No matter how well you have prepared for the Wedding or how much money has been spent, if the food items are not upto the mark then everything goes in vain altogether. Although there are a lot of caterers in Dehradun providing an extensive menu of Wedding and other celebrations but there is a serious dearth of quality Wedding Caterers in Dehradun. Black Pepper Restaurant located in the heart of the city, has always been among the best Restaurants in Dehradun, since its existence. With its extensive Multi-Cuisine food menu, coupled with impeccable quality and service, Black Pepper is a well established Restaurant in Dehradun. It’s been a while now that Black Pepper has spread its wings and now offers a huge banquet hall for Wedding and every other celebration. Black Pepper also provides in house and outdoor catering service in Dehradun. Having catered in over hundreds of Weddings and other gala celebrations, Black Pepper is now among the Best Wedding Caterers in Dehradun. 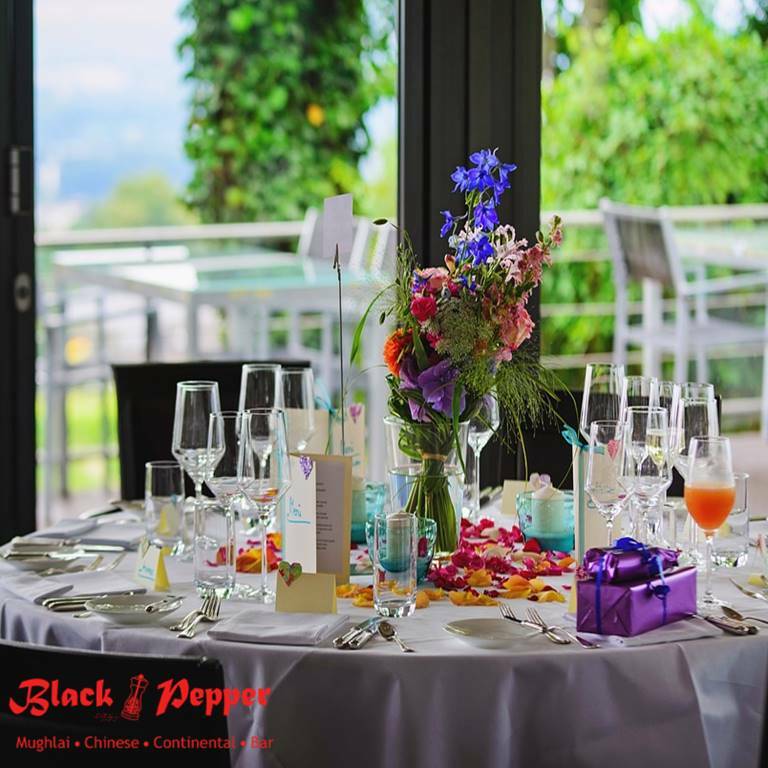 At Black Pepper we understand the prominence of a Wedding and carefully prepare for every individual Wedding to everyone’s delight. From a number of pre-decided Menu options to every possible customized Menu, Black Pepper has the best catering to offer for every Wedding celebration. Whether you need more focus on entrees or a wide variety of multi-cuisine food menu for the Wedding, we have every base covered.So the next time you have a Wedding lined up and are looking for the Best Wedding Caterer in Dehradun, feel free to contact us and we will have everything take care for you to your satisfaction.